Material: Linen 50% and cotton 50%. Machine washable. The colors different, a gold and a cream. Very nice condition. 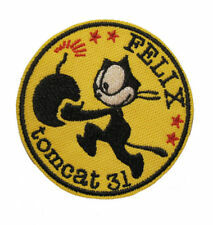 Felix the Cat Embroidered Patch "Tomcat 31". Notorious aviators have soared the skies with Felix on their shoulders. Add Patch to Whatever Suits Your Fancy! This Design is a Stitched Embroidered Patch, Made to Last! This is a matching handmade set with a half apron and sun bonnet. The apron is white trimmed in light blue fabric with a light reddish orange clover pattern. The bonnet is made with the same fabric that trims the apron. The apron measures 24" in length and 21" in the waist (excluding the ties); it has a 7 1/2" pocket. The brim of the bonnet measures 17" wide and 7" wide (from the gathered area to the outer edge) and 13" long at the back from the gathered area to the bottom hem. The bonnet is in excellent condition; the apron has three small spots in a row that may or may not come out with laundering. This handkerchief or doily is truly a work of art! The embroidery design covers the entire area, which is 11" square. It is most likely 100% cotton and is in excellent condition. Each corner has a floral design with trailing vines and pink flowers. This is so pretty. You want this one. The edges seem a little darker than the rest of the bag. Actual color may differ from the photos due to lighting. Set of 3 Robert Darr Wert ~ Textile Art ~ Country Prints by Hand on Pure Linen - all include Original Card. 9" x 7" - all are in very good, clean, as new condition. Very little fraying on edges. All cards are also in very good, clean condition (no discoloration, no tears). Walter Lantz Universal Studios Woody Woodpecker Zany Screwball Bird. Sew On Embroidered Patch ~ Woody Woodpecker Embroidered Patch "Ta Da Woody Woodpecker". Add Patch to Whatever Suits Your Fancy! This Design is a Stitched Embroidered Patch, Made to Last! See photos for closer details. TINKERBELL #3. 10 PHOTO FRIDGE MAGNETS. make Supersized seem small. Get images that. This Design is a Stitched Embroidered Patch, Made to Last! Patch is IRON ON, or You Can Sew On If You Wish. Apply Patch to Any Iron Safe Material. Add Patch to Whatever Suits Your Fancy! Jacket, Jeans, etc. not included. Used thin terry cloth loop vintage las Vegas Pistol Club Drink all night pistol dawn souvenir towel. Please see photos for additional information and measurements. Vintage Laundry Bag Embroidered Child And Puppy . Condition is Used. Shipped with USPS First Class Package. BIONIC WOMAN. 10 PHOTO FRIDGE MAGNETS. You're bidding on an Old Fisherman's towel. Please see pictures for details and condition and only bid if you will take the time to leave a 5-star feedback for the item pictured. I ship as soon as I can after receiving cleared payment. Be sure to follow me as a seller's as I have many more unique and interesting items coming soon! 3.05 yards uncut- Digital print japan satin 44 inch wide/112 cms- digital print.excellent feel & texture.ideal for blouses,tops,casual skirts,etc.please ask any questions before bidding.continuous yardage available usd$ 9.99 for 3.05 yard piece plus shipping. 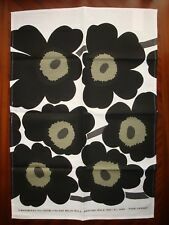 MICRO VELVET DIGITAL PRINT FABRIC 44"WIDE,100% POLYESTER VELVET-MICRO-VELVET IS SUITABLE FOR ALL CLIMATES. Felix the Cat Embroidered Patch ~ Round Patch Felix the Cat Head Shot. Felix the Cat and His Bag of Magic Tricks. Patch is IRON ON, or You Can Sew On If You Wish. This Design is a Stitched Embroidered Patch, Made to Last! Iron On/Sew On Patch ~ Mickey and Minnie Mouse "Santa Hats". This Design is a Stitched Embroidered Patch, Made to Last! Patch is IRON ON, or You Can Sew On If You Wish. Apply Patch to Any Iron Safe Material. Alice in Wonderland Cheshire Cat Toothy Grin Patch. We're All Mad Here Embroidered Patch. Patch is IRON ON, or You Can Sew On If You Wish. Apply Patch to Any Iron Safe Material. Add Patch to Whatever Suits Your Fancy! Jack Skellington King of Pumpkin Town "I'm A Nightmare Before Coffee". Patch is IRON ON, or You Can Sew On If You Wish. Apply Patch to Any Iron Safe Material. Add Patch to Whatever Suits Your Fancy! Antique German Stumpwork illustration, c. 1800s. Delightful comical vignette beautifully crafted in thread embroidery on linen, signed "AB" and dated, 1875. Absolutely charming scene of a couple winding a yarn ball together. Featuring colors of red, cream, black, blue, green, brown, gold, on a coffee color linen background. Exquisite! Quality burlwood frame with mitered edges, and glass. Good condition, not examined out of frame. Light aging/dust consistant with age, paper on reverse of frame has some tares. Some surface scratches on bottom of frame. Ready to hang. Measuring approx. 11"h by 8.5"w (sight), 13'h x 10.5"w (frame). This is an embroidery collectors dream! Please be sure to check out our other listings of antique German Stumpwork by this artist!. 2 sheets on ecru / off white cotton filled with patches / appliques - all the mod slang / words of the 60's Hippie generation in designs popular of the era like butterflies, sun, frog, hearts etc., average size is 4" X 4". LESPORTSAC "STRAWBERRY PATCH" SMALL ZIPTOP SHOPPER •NWT! •12" x11" •PRETTY!!! It's 12" x 11.5" x about 4" and has double handles that have a 12" drop. It has a small privacy pocket inside. Marlboro Country Store Red Leather Duffle Bag Travel Luggage 22" x 17" x 12"
Used in excellent condition. All zippers work, very strong bag. Has a stain. Here for sale is a beautiful travel or storage booklet/pochette for your lingerie, scarves, and delicate jewelry. There are a few light spots. This is in good displayable usable condition. Lucky new owner will possess this amazing old authentic hand woven Hmong children's vest jacket. Size would fit a slim child around 10 years old. The more one looks at the intricate sewing & soft baby colors used to make this superb weaving, one sees a richness from the famous golden triangle. Antique German Stumpwork illustration, c. 1876. Delightful comical vignette beautifully created in thread embroidery on linen, signed "AB" and dated. Absolutely charming scene of Mother tending to walkin baby and two kittens playing with yarn ball. Terrific domestic kitchen scene. Featuring colors of dark red, cream, black, blue, gold, on a coffee color linen background. Exquisite! Quality burlwood frame with mitered edges, and glass. Good used vintage condition, not examined out of frame. There is a chip to the top left corner of frame. Ready to hang. Measuring approx. 11"h by 8.5"w (sight), 13'h x 10.5"w (frame). This is an embroidery collectors dream!.